Huge Savings Item! Free Shipping Included! Save 13% on the Camcorder Camera Digital Video Recorder FHD 1080P 24MP WiFi Connection With Night Vision 3'' LCD Touch Screen by Gonpon at Pacs BG. MPN: HDV-G9. Hurry! Limited time offer. Offer valid only while supplies last. 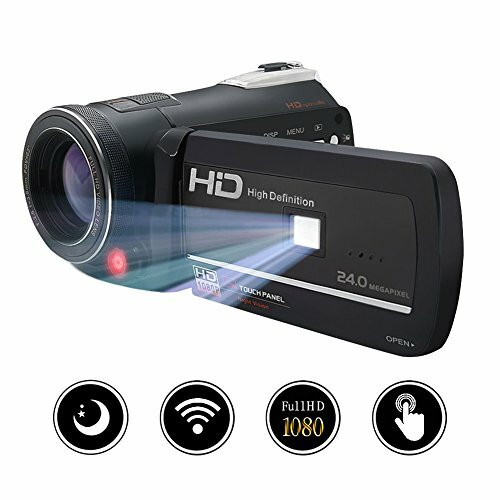 ❤BIG SALE❤ ❤❤Normal price:159.99 Sale price:139.99❤❤ This digital camcorder records FULL HD video at 1080p 30fps and it can also take pictures at 24MP. The picture/video quality of this video recorder is good and it has 18X digital zoom which can help you clearly record every wonderful moment of your life. This camera is lightweight so it is very convenient to record video and take photos for traveling or outdoor activities. This is a night vision camcorder which is equipped with infrared LED lights. It is easy to go through menus to enable night vision mode. IR images are black and white in night shot mode. Dual LED lights' working distance is 10 to 16 FT and it has great night shooting effect. It is useful for your ghost hunting at night. This camcorder has touch screen which helps you easily operate it. This digital video recorder has equipped with HD 8.0MP IMX179 Sony CMOS sensor. Its CMOS image stabilization technology is suitable to the high sensitivity of electronic image stabilization technology. Powerful solution for hand shake or was made fuzzy quality problems caused by the moving object,dual stabilization,take a better picture.Support HDMI output on the TV. This WIFI camcorder can be easily connected with your smart phone or tablet. You can download "LzxViewer" APP, open the camera display and click on WIFI app, WIFI name and password will be shown on the screen, use your phone or tablet wifi connect to your digital camcorder for take photos and shoot digital videos.Normally we recommend the wifi connection effective range less than 9.8 feet. One-year warranty is provided by Gongpon. Customer service will be provided within 24 hours. It can record while charging so you can use your power bank when needed. The battery for this camera is NP40(3.7V 1000MAH) and the charger is included in the standard package. It has tripod thread hole for an standard tripod connection and it can support up to 64GB SDHC/SD card (Note: please format SD card before use and the SD card need to be purchased separately). If you have any questions about this product by Gonpon, contact us by completing and submitting the form below. If you are looking for a specif part number, please include it with your message.